The Middle East has long been fraught with tension and volatility. However, the recent Arab uprisings have intensified instability, turning this 'hot-spot' into a veritable tinderbox whose potential for implosion has far-reaching regional and global consequences. 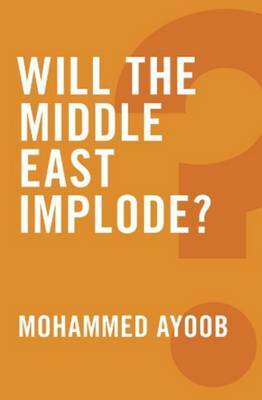 In this short book, leading Middle East scholar Mohammed Ayoob argues that the Arab Spring has both changed and charged some of the region's thorniest problems - from the rise of political Islam to Iran's nuclear ambitions, the Israel-Palestine conflict to rivalries between key regional powers. Exploring the sources of conflict in the Middle East and their various linkages, Ayoob offers a thoughtful and balanced assessment of whether the region is indeed destined for implosion or whether political sagacity and diplomatic creativity can bring it back from the brink.